ModMic Wireless delivers full DVD quality sound with blistering aptX enhanced speeds 5 times faster than standard Bluetooth. With increased speed and data, ModMic delivers a broadcast quality signal unheard of in wireless microphones. The 12+ hour battery can be charged while in use, ensuring you never miss a moment. The elegant digital quick mute silences the mic instantly. The special sauce that makes ModMic Wireless amazing! Unlike competing products, the ModMic dedicates the full bandwidth to only the mic, resulting in a near invisible latency of only 34ms, 5 times faster than the average Bluetooth device! Most wireless headsets only give the microphone narrow band audio, many as low as 4khz! The ModMic Wireless delivers a full 16bit, 48khz (DVD Quality) signal with a 20hz to 20khz frequency response range: Simply put that’s on par or better than most wired microphones! Two different microphone modes in one package! The omni-directional mode features a wider frequency response range, perfect for recording and streaming, while the uni-directional mode provides a crisp, clear, signal which blocks out unwanted background noise. The built in quick mute instantly silences the mic at the press of a button. The USB receiver’s status indicator light lets you know when you’re muted, so you’ll know for sure. Now your friends don’t have to listen to your dog bark every time the mail arrives! Featuring a 12+ hour battery and the ability to charge while in use via the included micro USB cable, the ModMic Wireless is always ready for gaming, work, and everything in between. 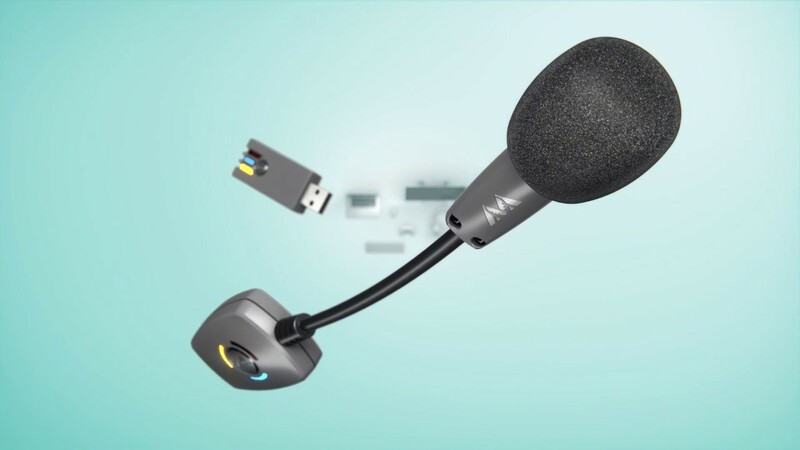 ModMic Wireless uses a proprietary USB Type-A Receiver which works on Windows, Mac, Linux, and Playstation 4 devices. Just plug and play! The ModMic Wireless is not compatible with Xbox 1. Hardware Compatibility: Windows, Mac, Linux and PS4 only.